WROBEL, K. , TOMCZEWSKI, K.
The article presents a comparison of two optimization methods aimed at the linearization of electromagnetic torque on rotor position angle in a two-phase switched reluctance motor (SRM). 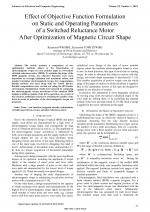 To optimize the shape of the SRM magnetic circuit, two objective functions were used, dependent on average, minimum and maximum values, and standard deviation electromagnetic torque. For computations, Matlab software was used along with the GAOT library. Parallel computations were carried out using the HTCondor environment. Optimization results were assessed by comparing the electromagnetic torque waveforms of the obtained SRM designs at different points of the drive operation. As a result of the research, additional criteria for assessing the quality of the drive in terms of pulsation of the electromagnetic torque are proposed. J. Furqani, M. Kawa, K. Kiyota, A. Chiba, "Current Waveform for Noise Reduction of a Switched Reluctance Motor Under Magnetically Saturated Condition," in IEEE Transactions on Industry Applications, vol. 54, no. 1, pp. 213-222, Jan.-Feb. 2018. Y. Mu, Y. Zhang, Z. Xie, M. Zhu, B. Zhao, "Control of torque ripple suppression and noise reduction of three-phase switched reluctance motor," Chinese Automation Congress (CAC), Jinan, 2017, pp. 2142-2147. H. Zeng, H. Chen, J. Shi, "Direct instantaneous torque control with wide operating range for switched reluctance motors," in IET Electric Power Applications, vol. 9, no. 9, pp. 578-585, 11 2015. M. Mansouri Borujeni, A. Rashidi, S. M. Saghaeian Nejad, "Optimal four quadrant speed control of switched reluctance motor with torque ripple reduction based on EM-MOPSO," The 6th Power Electronics, Drive Systems & Technologies Conference (PEDSTC2015), Tehran, 2015, pp. 310-315. R. Mikail, I. Husain, M. S. Islam, Y. Sozer, T. Sebastian, "Four-Quadrant Torque Ripple Minimization of Switched Reluctance Machine Through Current Profiling With Mitigation of Rotor Eccentricity Problem and Sensor Errors," in IEEE Transactions on Industry Applications, vol. 51, no. 3, pp. 2097-2104, May-June 2015. Y. Li, D. C. Aliprantis, "Optimum stator tooth shapes for torque ripple reduction in switched reluctance motors," International Electric Machines & Drives Conference, Chicago, IL, 2013, pp. 1037-1044. Y. Zhang, B. Xia, D. Xie, C. S. Koh, "Optimum design of switched reluctance motor to minimize torque ripple using ordinary Kriging model and genetic algorithm," International Conference on Electrical Machines and Systems, Beijing, 2011, pp. 1-4. J. Ye, B. Bilgin, A. Emadi, "An Offline Torque Sharing Function for Torque Ripple Reduction in Switched Reluctance Motor Drives," in IEEE Transactions on Energy Conversion, vol. 30, no. 2, pp. 726-735, June 2015. J. Zhu, K. W. E. Cheng, X. Xue, Y. Zou, "Design of a New Enhanced Torque In-Wheel Switched Reluctance Motor With Divided Teeth for Electric Vehicles," in IEEE Transactions on Magnetics, vol. 53, no. 11, pp. 1-4, Nov. 2017. J. W. Jiang, B. Bilgin, A. Emadi, "Three-Phase 24/16 Switched Reluctance Machine for a Hybrid Electric Powertrain," in IEEE Transactions on Transportation Electrification, vol. 3, no. 1, pp. 76-85, March 2017. S. R. Mousavi-Aghdam, M. R. Feyzi, N. Bianchi, M. Morandin, "Design and Analysis of a Novel High-Torque Stator-Segmented SRM," in IEEE Transactions on Industrial Electronics, vol. 63, no. 3, pp. 1458-1466, March 2016. X. Deng, B. Mecrow, H. Wu, R. Martin, "Design and Development of Low Torque Ripple Variable-Speed Drive System With Six-Phase Switched Reluctance Motors," in IEEE Transactions on Energy Conversion, vol. 33, no. 1, pp. 420-429, March 2018. E. K. Beser, S. Camur, B. Arifoglu, E. Beser, "Design and Analysis of an Axially Laminated Reluctance Motor for Variable-Speed Applications," Advances in Electrical and Computer Engineering, vol.13, no.1, pp.75-80, 2013. S. Cai, J. Shen, H. Hao, M. Jin, "Design methods of transversally laminated synchronous reluctance machines," in CES Transactions on Electrical Machines and Systems, vol. 1, no. 2, pp. 164-173, 2017. H. A. Moghaddam, A. Vahedi, S. H. Ebrahimi, "Design Optimization of Transversely Laminated Synchronous Reluctance Machine for Flywheel Energy Storage System Using Response Surface Methodology," in IEEE Transactions on Industrial Electronics, vol. 64, no. 12, pp. 9748-9757, Dec. 2017. M. Lukaniszyn, K. Tomczewski, A. Witkowski, K. Wrobel, M. Jagiela. "Rotor Shape Optimization of a Switched Reluctance Motor." Monograph Intelligent Computer Techniques in Applied Electromagnetics, Applications of Computer Methods, Springer 2008; Berlin, vol. 119, pp. 217-221. P. Bogusz, M. Korkosz, A. Powrozek, J. Prokop, "A two-phase switched reluctance motor with reduced stator pole-arc," International Conference on Electrical Drives and Power Electronics (EDPE), Tatranska Lomnica, 2015, pp. 312-318. Kano, T. Kosaka, N. Matsui, "Optimum Design Approach for a Two-Phase Switched Reluctance Compressor Drive," in IEEE Transactions on Industry Applications, vol. 46, no. 3, pp. 955-964, May-june 2010. R. T. Naayagi, V. Kamaraj, "A Comparative Study of Shape Optimization of SRM using Genetic Algorithm and Simulated Annealing," Annual IEEE India Conference - Indicon, 2005, pp. 596-599. J. Zhang, H. Wang, L. Chen, C. Tan, Y. Wang, "Multi-Objective Optimal Design of Bearingless Switched Reluctance Motor Based on Multi-Objective Genetic Particle Swarm Optimizer," in IEEE Transactions on Magnetics, vol. 54, no. 1, pp. 1-13, Jan. 2018. C. Lopez, T. Michalski, A. Espinosa, L. Romeral, "Rotor of synchronous reluctance motor optimization by means reluctance network and genetic algorithm," XXII International Conference on Electrical Machines (ICEM), Lausanne, 2016, pp. 2052-2058. M. H. Mohammadi, T. Rahman, R. Silva, M. Li, D. A. Lowther, "A Computationally Efficient Algorithm for Rotor Design Optimization of Synchronous Reluctance Machines," in IEEE Transactions on Magnetics, vol. 52, no. 3, pp. 1-4, March 2016. T. Raminosoa, B. Blunier, D. Fodorean, A. Miraoui, "Design and Optimization of a Switched Reluctance Motor Driving a Compressor for a PEM Fuel-Cell System for Automotive Applications," in IEEE Transactions on Industrial Electronics, vol. 57, no. 9, pp. 2988-2997, Sept. 2010. 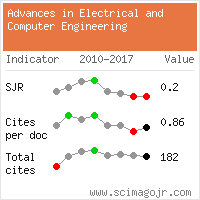 Citations for references updated on 2019-04-19 14:46 in 169 seconds.